Iranian authorities on Monday blamed neighbouring Iraq for a sandstorm that knocked out power in an oil-rich southern province and sparked protests against local officials. 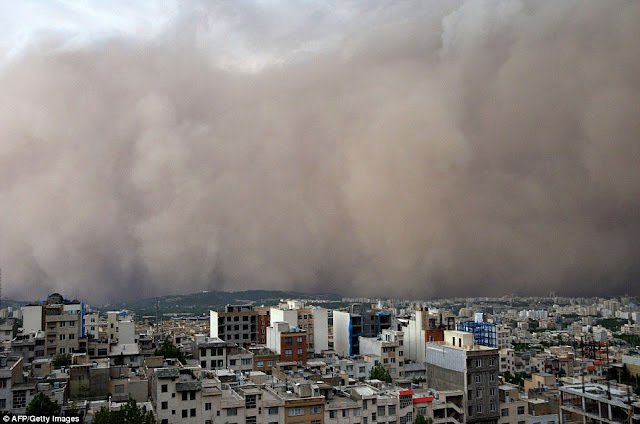 Masoumeh Ebtekar, a vice president in charge of environmental affairs, called on Iraq to implement an agreement to prevent dust storms by spreading mulch over 3,500 sq. miles (9,000 sq. kilometres) of desert, state TV reported. Iraqi officials could not immediately be reached for comment. The sandstorm temporarily cut off power and water to much of the Khuzestan province, and reduced oil production by 700,000 barrels per day. The state-run IRNA news agency quoted a local health official as saying that 218 people were hospitalized for respiratory problems because of the storm. Last week hundreds of Iranians protested in the city of Ahvaz, demanding the resignation of Ebtekar and the provincial governor. Authorities have since banned protests over the issue. Iran's Supreme Leader Ayatollah Ali Khamenei on Monday urged the government to take "swift and explicit" action to address the fallout from the dust storm. Iran says the dust storms originate in Iraq, Saudi Arabia, Jordan and Syria, and has urged authorities in those countries to combat the problem with irrigation projects and other measures. Global warming is not at all an obsolete area to study and watch but it is unquestionably one of the biggest concerns for many developing and under developing countries all across the globe. What makes people and activist communities to shout on is a set of a few reasons or rumors regarding any given topic. I am an earth sciences expert and I have taught many online students who belong to online life experience college degree and most of them asked me the similar questions regarding some of the middle eastern countries and every time I came across a number of conclusions regarding governments conflicts on geo political level as one of the biggest element for such warnings and have no direct relationship with the actual decrease in their resources production levels.